Foghat can be booked through this site. Foghat entertainment booking site. Foghat is available for public concerts and events. 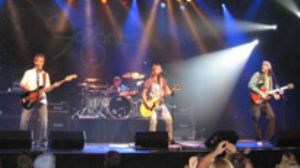 Foghat can be booked for private events and Foghat can be booked for corporate events and meetings through this Foghat booking page. Unlike most middle agents that would mark up the performance or appearance fee for Foghat, we act as YOUR agent in securing Foghat at the best possible price. We go over the rider for Foghat and work directly with Foghat or the responsible agent for Foghat to secure the talent for your event. We become YOUR agent, representing YOU, the buyer. In fact, in most cases we can negotiate for the acquisition of Foghat for international dates and newer promoters providing you meet professional requirements. Foghat specialized in a simple, hard-rocking blues-rock, releasing a series of best-selling albums in the mid-'70s. While the group never deviated from their basic boogie, they retained a large audience until 1978, selling out concerts across America and earning several gold or platinum albums. Once punk and disco came along, the band's audience dipped dramatically. With its straight-ahead, three-chord romps, the band's sound was American in origin, yet the members were all natives of England. Guitarist/vocalist Lonesome Dave Peverett, bassist Tony Stevens, and drummer Roger Earl were members of the British blues band Savoy Brown, who all left the group in the early '70s. Upon their departure, they formed Foghat with guitarist Rod Price. Foghat moved to the United States, signing a record contract with Bearsville Records, a new label run by Albert Grossman. Their first album, Foghat, was released in the summer of 1972 and it became an album rock hit; a cover of Willie Dixon's I Just Want to Make Love to You even made it to the lower regions of the singles charts. For their next album, the group didn't change their formula at all -- in fact, they didn't even change the title of the album. Like the first record, the second was called Foghat; it was distinguished by a picture of a rock and a roll on the front cover. Foghat's second album was their first gold record, and it established them as a popular arena rock act. Their next six albums -- Energized (1974), Rock and Roll Outlaws (1974), Fool for the City (1975), Night Shift (1976), Foghat Live (1977), Stone Blue (1978) -- all were best-sellers and all went at least gold. Slow Ride, taken from Fool for the City, was their biggest single, peaking at number 20. Foghat Live was their biggest album, selling over two million copies. After 1975, the band went through a series of bass players; Price left the band in 1981 and was replaced by Erik Cartwright. Book Foghat for your next event! Would you like to have Foghat perform at your next corporate event, party or concert? Simply fill out the simple interest form below, and we’ll start the booking process.